And as well consider I thy constant prayer in special to learn the treatise of the Astrolabe…therefore I have given thee a sufficient Astrolabe as for our horizons, compounded after the latitude of Oxford; upon which, by means of this little treatise, I purpose to teach thee a certain number of conclusions pertaining to the same instrument. 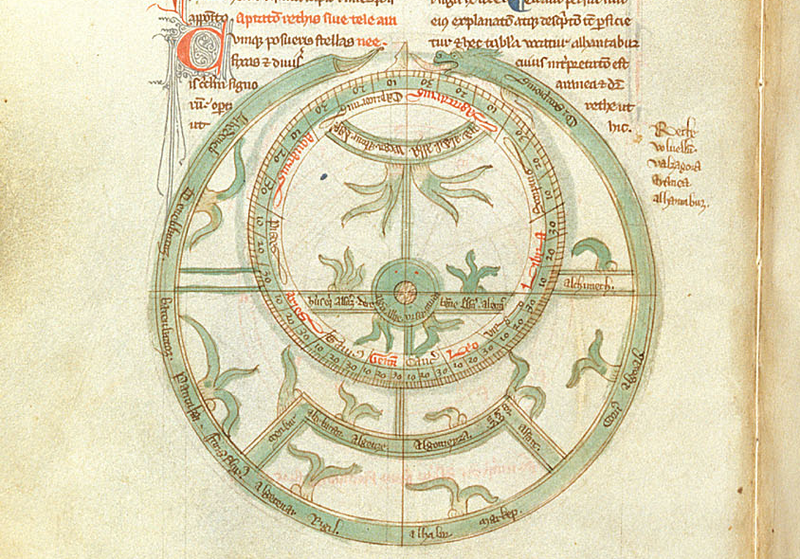 Though the astrolabe may seem foreign and inaccessible today, for Chaucer in medieval England, the tool was so crucial to understanding one’s place in the universe that he wrote an essay describing how to use the instrument. As a tool for astronomy education in the late Middle Ages, the astrolabe held a central role in promoting a scientific understanding of the Universe and Earth. During the Middle Ages, an educated child in either England or Continental Europe was expected to understand how to use and build an astrolabe. Thus, Chaucer engaged in a typical practice of his age in bestowing an astrolabe unto his son. The instrument Chaucer bequeathed to his son was invented sometime before the late fourth century CE, when Theon of Alexandria (c.335–c.405 CE), a Greco-Egyptian scholar and mathematician, wrote a tract on it. From its origins based in a western geographical context, the astrolabe gradually moved eastward. In the middle of the seventh century CE, Severus Sebookht composed the first non-Greek treatise on the astrolabe in Syriac, in imitation of Theon’s essay (Pingree, 2009, xii). By 1267, the astrolabe reached Kublai Khan (1215–94) in China via the travels of the Persian astronomer Jamal al-Din. In 1370, the first Sanskrit treatise on the astrolabe was composed.